Wainhill Crossing Halt was a halt on the Watlington and Princes Risborough Railway which the Great Western Railway opened in 1925 to serve the Oxfordshire hamlet of Wainhill. The opening of the halt was part of a GWR attempt to encourage more passengers on the line at a time when competition from bus services was drawing away patronage. Opened in 1925, the halt - the last station to open on the line - sought to encourage passenger traffic in the face of increased competition from buses. It was situated to the south of a level crossing over an unclassified road leading to Lower Wainhill and Hempton Wainhill. The lane saw very occasional traffic as it was unsuitable for motor vehicles and only served nine or ten houses on the eastern side of the Watlington and Princes Risborough Railway. A modest crossing keeper's cottage had been provided by the railway company which comprised two ground floor rooms and one bedroom on the first floor; there was no mains water, gas or electricity. The crossing keeper was responsible for keeping the lamps alight on the gates and, once the station had opened, trimming and lighting the two oil hurricane lamps hung on posts to illuminate the single platform. 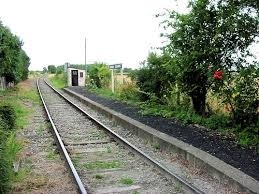 Following the withdrawal of passenger services in 1957, the line through Wainhill Crossing remained open until July 1990 for the purposes of coal, gypsum and cement movements to and from the Rugby Portland Cement Company's factory near Chinnor. Negotiating Wainhill Crossing, by this time unmanned, required trains to be brought to a halt by the crossing whilst a crew member opened and closed the gates; this was particularly awkward as the line descends at a 1 in 73 gradient here and was subject to a speed restriction of 5 mph.